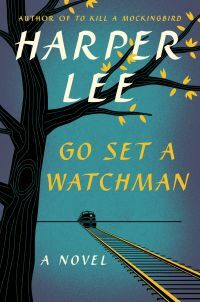 There has been a lot of drama and speculation around the release of Harper Lee's Go Set a Watchman. It began with concerns around whether Harper Lee was taken advantage of; did she even want to release this book? And then, once the book came out, it erupted into consternation that Atticus Finch was not the beloved hero we all know and love and name our kids/dogs/cats after, but was actually... well, kind of racist. Luckily for readers, Atticus' daughter Scout is also appalled at learning that her dad's a racist. Misery loves company! It took a lot of effort for me to crack open the cover of Go Set a Watchman. I really wasn't sure I wanted to read it. I'm glad, now that I'm done, that I did read it, but I don't think I want to read it ever again. I wouldn't say it is a very tightly-written novel. The lack of editing is pretty obvious; a lot of conversations seem to swirl around without getting anywhere, and there is a very frustrating lack of resolution at the end of the book. I want to believe that Harper Lee had some agency in the book's publication. That she is aware of what's happening in the United States and thought, "Now's the time!" and thus published this book. I want to believe that To Kill a Mockingbird was the book we all needed in the 1960s, with the white male hero swooping in with a grand (failing) effort to save the day. And now, what we need is Go Set a Watchman, a way for us to see that ideals need to be cared for and tested for them to last long-term, and to show us just how hypocritical and ridiculous some of our arguments are. But even if I do believe that Lee had agency in this whole situation, I just don't think she was very successful in her attempt. There are a lot of important points made in this story, but hardly any deep discussion or introspection. And everyone in the book is so unaware of their own privilege, it is almost laughable. That's what ultimately frustrated me so much about this book. It just doesn't challenge the status quo enough. And maybe in that way, it's very much a product of the time it was written (in the 1950s and 1960s), and not a product of the time it was published. Had she insight, could she have pierced the barriers of her highly selective, insular world, [Scout] may have discovered that all her life she had been with a visual defect which had gone unnoticed and neglected by herself and by those closest to her: she was born color blind. Seriously?! The only people who ever say (and believe) they are color blind are white people, but Lee never once questioned Scout's flawed logic here. Even later, when Scout's semi-boyfriend Hank (whom she now distrusts because he's racist) tries gently to point out her own privilege as a member of an old, wealthy and respected family in Maycomb, she is completely unwilling to accept it. "Hank. That is untrue and you know it. It's unfair and it's ungenerous, but more than anything in this world it's just not true... you've got some kind of complex." This story could have been so much stronger if later, Scout considered her own biases. For example, after taking her high moral ground as "color blind," she goes to visit her nanny, Calpurnia, whose grandson is going to jail for manslaughter (great timing, Scout). While there, she never once considers the fact that maybe she is not quite as color blind as she thinks she is, or that maybe it's easy to be blind to color when you are in a place of privilege. Similarly, she never thinks about privilege as someone from a very wealthy Maycomb family. She just assumes that everyone else is wrong and assumes that her kicking and screaming is evidence of her being a better person than they are. Most people focus on Atticus' fall from grace in this book, and he does say some vile, miserable things that were very hard to stomach. But Scout was a moral compass and strong character in To Kill a Mockingbird, too, and one that was far more approachable and real than Atticus probably was. And so her fall from grace was even harder for me. She says she's color blind but she uses the same ridiculous story about the federal government encroaching on "states' rights" that people have been using from the days of slavery to the days of civil rights to today. And goes on to say, "Well, it seemed to me that to meet the real needs of a small portion of the population, the Court set up something horrible that could - that could affect the vast majority of folks. Adversely, that is." But she's not racist. She didn't care that it was black people who were the small portion of the population the Court "set up something horrible" for. She would have felt the same way no matter which tiny population came barging into the schools, adversely affecting the lives of everyone else already there. Can you see why I was so frustrated? Honestly, Go Set a Watchman felt very much like a long-winded internal monologue without any resolution. All that happened was that Scout realized her dad wasn't perfect (and yet had no such similar epiphany about herself), but that she loved him, anyway, for teaching her how to make up her own mind. And that was that. And it was just not even close to enough. Interesting review. I think time well tell with this book. I wonder if people will even still know if it generally in twenty years, though I do worry about how it will affect Mockingbird's reputation overall. And I don't quite understand why I worry about that so much. I re-read Mockingbird last year, maybe the year before, and found it problematic overall. I didn't come away from it as a big fan. What you say here about Watchman add more fuel to the "this is a first draft" fire. While the stories are clearly very different, your reading of Watchman makes me think it was a first attempt(draft) that was set aside. Sounds like it should have been left aside, too. As I said, time well tell. That's so interesting about how you found Mockingbird problematic when you re-read it last year. I re-read it about five years ago and loved it even more the second time through, though I think I loved the episodic nature of it more than I did the courtroom plot. I liked all the secondary characters, very few of whom are at all referenced in this book. I was always under the impression that this was an early draft of To Kill a Mockingbird that Lee extensively re-worked into To Kill a Mockingbird. I think it will be interesting to scholars to try and piece together what Lee did to make it work, but I don't see this becoming a very cherished book for anyone. I just don't think I can read this one. I was really looking forward to it, but as the time drew near, I started back tracking. Then the reviews started, and my backtracking became backrunning. Great review. I like your emphasis on Scout's inability to see her own privilege and how it limits her. But I don't want to read Watchman. I liked Mockingbird too much. There is an interesting review in the New Yorker that points out how typical Atticus was at the time with both his conservatism and his willingness to stand up for fairness for an individual. Yes, those are the parts that I think DO work in this novel - that Atticus could really believe in a specific person's rights to justice but not want it for the whole race. The whole, "One murdered person is a tragedy; 1,000 murdered people is a statistic" sort of argument. I think she could have done well with that, but it didn't quite get there. That color-blind quote is something that would bother be less in a book published back when this book was actually written. Even though it's not a remarkably progressive idea, for Alabama in the 1950s, it would be. In fact, I'd be really surprised to see someone of Lee's background interrogating that idea back then. But the book is published today, which puts remarks like that in a different context. But it's weird that she seems to see it as an actual literal physical defect, rather than a figurative sort of blindness. I've not been particularly interested in reading this, mostly because I don't have the attachment to TKAM (or Atticus Finch) that a lot of people have. It doesn't even surprise me much that the same character (if you see them as the same) would have racist views. Ditto Scout. Racism in the South is complicated, with the same person wanting justice in one situation and wanting to keep the races separate in others. I wasn't really surprised by Atticus. Or, that's not true. I guess I can see how often people can justify their actions and thoughts in the way that he did. So maybe I am more cynical than other people are. But Scout bothered me a lot more. I'd really like for Lee to have had the kind of agency you describe in publishing this book. Even better would be if she'd been able to edit this book and improve it and have it reflect some of the nuance of race in America in modern times. But yeah, for me too, it didn't go nearly far enough in depicting the way racism can wear a lot of different faces, not all of which look like Bob Ewell. You voice some of the same concerns and feelings I had when reading this book. Mostly I just had a continnuous feeling of visceral repugnance. I felt the same way you did about Scout/Jean-Louise's unexamined racism. My friend kept texting me (we were reading at the same time)....Jean-Louise says she's "color-blind"....ugh. Yes. Thanks for a great review. I know, that drove me crazy. Though, as Teresa and Buried in Print have pointed out, perhaps I'm looking at it with too modern a mindset. Very interesting; I've been avoiding reviews of this one but was very curious about your thoughts. What I can't tell for sure is whether your frustration is with the fact that Scout's character is too believable or poorly drawn? Despite being well-intentioned in TKaM, she was very young, and immersed in that society, so it seems likely that she would grow up to think/say the kinds of things that you've quoted. The kind of insulated and privileged thinking you've described seems believable from just the brief glimpses you've given (but of course I haven't read the book). Did you just wish that she was a different kind of person or did you feel that Harper Lee did not create her well/do her justice? You make a very good point. I think my frustration lies more with Lee. In my opinion, this book is about Scout realizing her father isn't perfect and finding her own voice, which falls under the general category of coming-of-age novel. But in a successful coming-of-age novel, the main character has to look inside, too. There has to be introspection. There is none of that here, and because of that, the novel fails for me. It's not so much that Scout isn't a believable character. I am sure she is, and that she is true to her age. But I don't understand the point of the novel if there's no epiphany on her part about herself, only about her father. Wouldn't it be ironic if the publication of the second book actually ends up exposing the weaknesses of the first (not necessarily in terms of crafting, but the deeper layers of racist conditioning which infiltrate TKaM)? I want to imagine all the same things that you've mentioned about Harper Lee's agency in the publication of this novel, and I also want to imagine that her own personal thinking and convictions have grown since she published TKaM. But maybe the kind of epiphany I'm longing for just isn't there. I'm still undecided as to read this one, but your thoughts on it do make me curious. Nonetheless, I'm more keen on Diversiverse reading now!